Silver is a transition metal with the highest electrical conductivity of all the elements. It also is the metal with the highest thermal conductivity. Domestic Production and Use: In 2009, the United States produced approximately 1,230 tons of silver with an estimated value of $520 million. Silver was produced as a byproduct from 33 base- and precious-metal mines. Alaska continued as the country’s leading silver-producing State, followed by Nevada; however, company production data are proprietary and were withheld. There were 21 refiners of commercial-grade silver, with an estimated total output of 4,020 tons from domestic and foreign ores and concentrates, and from old and new scrap. Silver’s traditional use categories include coins and medals, industrial applications, jewelry and silverware, and photography. The physical properties of silver include ductility, electrical conductivity, malleability, and reflectivity. The demand for silver in industrial applications continues to increase and includes use of silver in bandages for wound care, batteries, brazing and soldering, in catalytic converters in automobiles, in cell phone covers to reduce the spread of bacteria, in clothing to minimize odor, electronics and circuit boards, electroplating, hardening bearings, inks, mirrors, solar cells, water purification, and wood treatment to resist mold. Silver was used for miniature antennas in Radio Frequency Identification Devices (RFIDs) that were used in casino chips, freeway toll transponders, gasoline speed purchase devices, passports, and on packages to keep track of inventory shipments. Mercury and silver, the main components of dental amalgam, are biocides and their use in amalgam inhibits recurrent decay. Recycling: In 2009, approximately 1,500 tons of silver was recovered from old and new scrap. This includes 60 to 90 tons of silver that is reclaimed and recycled annually from photographic wastewater. Import Sources (2005-08):2 Mexico, 54%; Canada, 26%; Peru, 15%; Chile, 3%; and other, 2%. Events, Trends, and Issues: In 2009, silver prices averaged $13.37 per troy ounce and peaked at $15.94 per troy ounce on June 2. The overall rise in silver prices corresponded to continued investment interest and holdings in new silver exchange traded funds (ETF) that have opened since the first silver ETF was established in April 2006. Silver ETF inventories totaled approximately 11,700 tons of silver through the end of October. Industrial demand for silver declined modestly. In the United States, demand for silver in photography fell to slightly more than 900 tons since peaking in 1999 at 2,290 tons. Silver is still used in x-ray films; however, many hospitals have begun to use digital systems. Approximately 99% of the silver in photographic wastewater may be recycled. Silver demand for industrial, photographic, jewelry, silverware, and coins decreased while demand in electronic applications increased. Silver was used as a replacement metal for platinum in catalytic converters in automobiles. Silver was used in clothing to help regulate body heat and to control odor in shoes and in sports and everyday clothing. The use of trace amounts of silver in bandages for wound care and minor skin infections is also increasing. World silver mine production increased to 21,400 tons in response to increased production at new and existing polymetallic mines.On a global scale, silver output from Bolivia increased somewhat owing to production at San Cristobal; however, water problems at the mine may limit production in 2010. Increased silver production took place at other lead-zinc mines, such as the Lucky Friday Mine in Idaho and Uchucchacua Mine in Peru. Silver production began at the Parmarejo Mine in Mexico and the San Bartolome Mine in Bolivia. In October, the Rochester Mine in Nevada announced an expansion of mining operations. 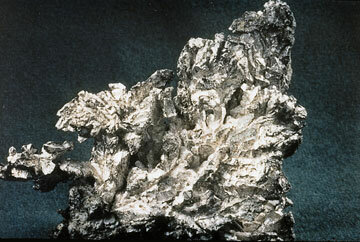 World Resources: Silver was obtained as a byproduct from processing and smelting copper, gold, and lead-zinc ores. Ores from these polymetallic deposits account for more than two-thirds of U.S. and world resources of silver; the remaining silver resources are associated with veins and submicroscopic gold deposits in which gold is the primary commodity. Most recent silver discoveries have been associated with gold occurrences; however, base-metal occurrences that contain byproduct silver will continue to account for a significant share of future reserves and resources. Peru, Mexico, and China are the world’s leading producers of silver, in descending order of production. Substitutes: Digital imaging, film with reduced silver content, silverless black-and-white film, and xerography substitute for silver that has traditionally been used in black-and-white as well as color printing applications. Surgical pins and plates may be made with tantalum and titanium in place of silver. Stainless steel may be substituted for silver flatware, and germanium added to silver flatware will make it tarnish resistant. Nonsilver batteries may replace silver batteries in some applications. Aluminum and rhodium may be used to replace silver that was traditionally used in mirrors and other reflecting surfaces. Silver may be used to replace more costly metals in catalytic converters for off-road vehicles. Pan American Silver (NASDAQ: PAAS) - http://www.panamericansilver.com/ - Silver mining, exploration, extraction, processing, refining, and reclamation in Peru, Mexico and Bolivia. BHP Billiton (NYSE: BHP) - Their Cannington mine is the world's largest and lowest cost single mine producer of silver and lead. 2011-07-22 - (bar) - How much higher can gold, silver go? 2011-04-07 - (reu) - Should you invest in gold or silver? 2011-01-31 - (usa) - Is loading up on silver a good investment idea?